HOUSE: Tell your Representative NOW that you oppose this tax plan that hurts working families. Dial the CWA Action Line at 1-855-980-2331 to connect to your Representative now! 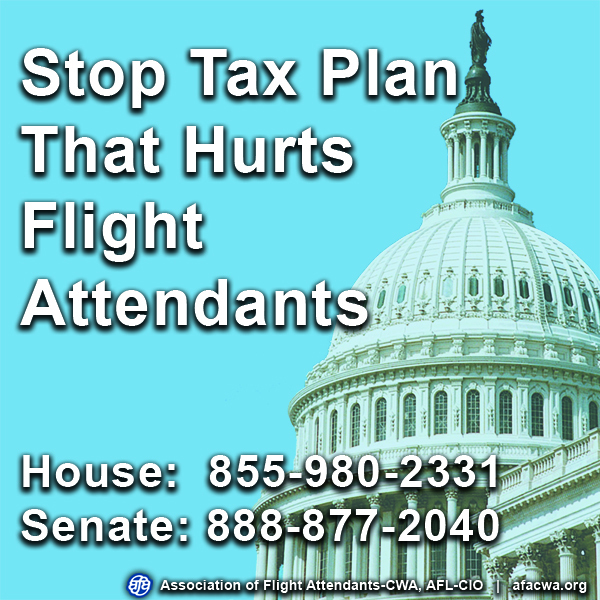 SENATE: Tell your Senator NOW that you oppose this tax plan that hurts working families. Dial the CWA Action Line at 1-888-877-2040 to connect to your Senator now! How does the GOP Tax plan hurt Flight Attendants and families? Removes employee business expense deductions. If it passes, Flight Attendants will not be able to deduct any flight crew expenses anymore, including uniforms, union dues, per diem for every city where you overnight – everything. This could result in Flight Attendants paying thousands of dollars more in taxes. Gives most of the tax cuts to the richest 1%. Raises taxes on 87 million middle-class families by 2027 to pay for tax breaks for the wealthy and corporations. Makes corporate tax cuts permanent, but makes tax cuts for individuals and families temporary. Kills American jobs by encouraging outsourcing and contingent pay (profit sharing in lieu of base pay) for jobs that remain. Mandates automatic Medicare cuts of at least $25 billion in 2018 and $400 billion over 10 years. Pays for corporate tax cuts by raising health care premiums and leaving millions of families without health coverage. We cannot allow tax cuts for the wealthy to harm millions of working families. AFA, CWA and our allies are fighting back against this massive transfer of dollars from working families to the richest 1 percent. In order to win, we need you to call. HOUSE: Dial the CWA Action Line at 1-855-980-2331 to connect to your Representative and tell them to oppose this tax plan that hurts working families! SENATE: Dial the CWA Action Line at 1-888-877-2040 to connect to your Senator and tell them to oppose this tax plan that hurts working families! Call this weekend and call again Monday!